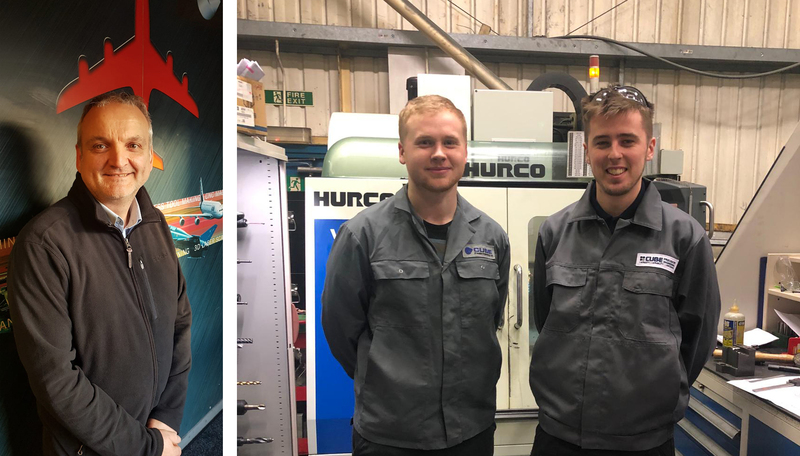 We’ve had a flying start to the year with three new starters joining us here at Cube Precision Engineering. Two new machinists Chris Beddard and Dean Hemming, along with our new Technical Sales Manager Malcolm Terry. Chris comes to us from one of the UK’s leading toolmakers.He trained ‘on the job’ and already has experience in running the Correa FP40milling machine. Dean is a former apprentice with a great deal of experience in mechanical manufacturing and using Hurco equipment. Dean completed his apprenticeship through In-Comm who are one of the UK’s top providers of training and business services. Our MD Neil Clifton is passionate about apprenticeships and personal development and visited them last week to find out more about training and apprenticeship opportunities that we can further develop here at Cube. Our customer base is growing and so too is our need for experienced customer managers. Malcolm joins us from AIM Engineering and is the perfect fit for our management team. Our recent growth has been within prime and tier one manufacturers and his previous experience of account management and operational management within these sectors will add significant value to the role. As well as servicing existing customers, Malcolm will be looking to develop further new business opportunities. In what could be classed as unsure times with the potential of Brexit just around the corner, here at Cube we are focusing on creating a positive future for our team and our customers.